UPDATE: Since the below case study was published in 2012, we are now seeing many students learning up to 16 times faster than traditional piano students. To learn more about how this is possible, please view How To Learn Piano 16 Times Faster. Today, I am delighted to announce the publication of the much anticipated Musiah Online Piano Lesson Study. 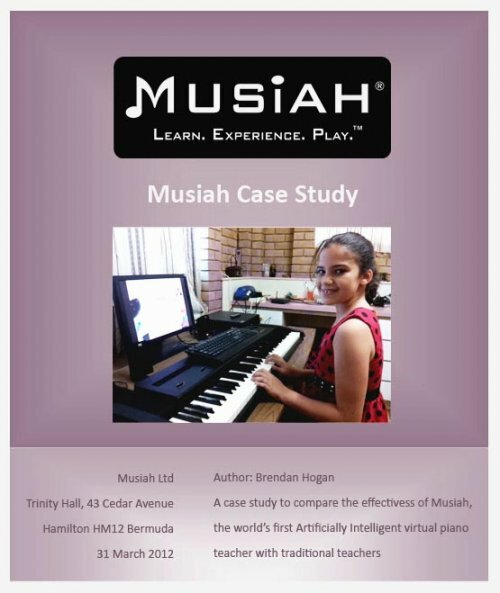 In summary, the Musiah Online Piano Lessons Study showed that in the first 10 weeks of learning piano, students learning with Musiah piano lessons progress 5-8 times faster than students learning the same syllabus through traditional piano lessons. It certainly makes interesting reading. Additionally, you may be interested in the following press release about the case study which was issued on Thursday April 5, 2012. A recently published online piano lesson study has shown that children who learn the piano with Musiah — the world’s first Artificially Intelligent virtual piano teacher in the guise of an alien from the year 4015 — learn the piano more quickly than children who learn the piano the traditional way. The ten-week online piano lesson study, whose participants included two sets of twins, compared the effectiveness of Musiah with traditional piano teachers by comparing the number and difficulty of tunes each student learnt; some students learnt exclusively with Musiah, while other students learnt with Musiah and a traditional piano teacher or with a traditional piano teacher alone. Beginner piano students aged from 7–12 will on average learn 4–6 pieces from this syllabus in ten weeks using traditional piano lessons. A similar average was achieved in the case study when a child learnt piano through traditional piano lessons. By contrast, children who learnt piano with Musiah learnt 17–26 pieces each. Interestingly, when one of the twins learned the piano using both Musiah and a traditional piano teacher, that twin progressed slower than the twin who learned exclusively with Musiah (though both twins progressed much faster than a student learning the piano solely through the traditional way). Musiah is available to support students at every step, 24/7. By contrast, a traditional piano teacher can be with their students just once a week during the lesson; for the rest of the time, students are left without much support. Because Musiah can teach students around the clock, lesson time and practice time become one: “Students [using Musiah] are not really practicing in the traditional sense so much as having a perpetual piano lesson”, Hogan says. Additionally, Hogan says, Musiah does a very good job of teaching the piano syllabus in a much more fun and enjoyable way — by taking children on an adventure that spans the entire galaxy. The full Musiah Online Piano Lesson Study is available HERE. Students can enroll in Musiah online piano lessons by clicking “Try Free” on the website. What Is The Process Of Preparing For A Piano Exam? Are Piano / Keyboard Exams Necessary Or Beneficial? What Is A Real Piano Lesson?